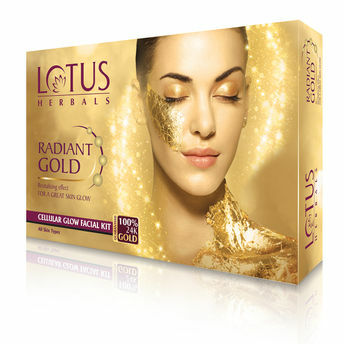 Revive your distressed face with the instantaneous glow of RADIANT GOLD Cellular Glow 1 FACIAL KIT, which has a single use and comes in a sachet that contains the goodness of 24K Gold Leaves, Horse Chestnut and Papaya extracts in four creams such as; Exfoliating Cleanser, Activator, Massage Cream with gold leaves and Gold Mask, revitalizes your skin giving it a tantalizing effect. Gives an even tone to your rough surfaced skin vanishing skin rashes and irritation. Relieves skin inflammations making skin satin like. Helps to maintain elasticity of your skin and boosts cell production. It comes with a Deep Cell Activation System and provides a youthful looking skin. Additional Information: Lotus Herbals is India's leading natural skincare and cosmetics company, known for their wide range of Ayurvedic and Herbal skin care, hair care and cosmetic products. Combining ancient wisdom from the Vedas with the latest technology, all their products are made from top quality, scientifically developed, herbal ingredients and are free from chemicals and animal-testing.